List and map of clubs from Benidorm to Torrevieja One of the most often received questions about the Costa Blanca we get from tourists and local residents is about where to find a golf course near Benidorm, Altea, Torrevieja or any other cities around the Costa Blanca. southern Costa Blanca from Alicante to Murcia and Torrevieja. While Gandia has its own small 6th hole golf course, the most well known one around is the Oliva Nova golf course. 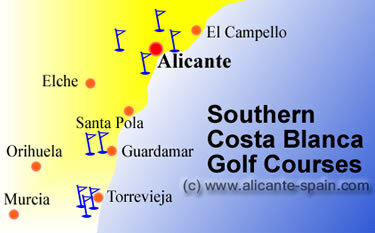 Designed 1995 by Severiano Ballesteros, the golf resort south of Oliva is one of the best courses at the Costa Blanca. Open all year, the 18 hole golf course charges approx. EUR 75 for the green fee. The entire area is more like a golf resort with hotels and permanent golf property to buy and rent. The ideal place if you want to spend a perfect golf week in Spain. 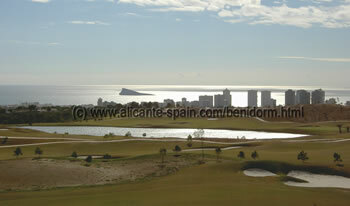 From Top to Bottom, Golf in Oliva Denia , Javea, Calpe , Altea, Benidorm and Alicante. From fellow Spanish world class golfer Jose Maria Olazabal comes the next 18 hole golf course. Designed in 1990, it offers a demanding 18 hole golf course and a driving range with over 20 bays. You find it around the village Jesus Pobre near Denia. Leave at exit 62 of the autopista AP7 and head in direction towards Denia and take a right to La Xara and Jesus Poble. It’s one of those clubs that should not be missed. Just outside of Javea ( Xabia ) in direction towards Benitachell (Benitatxell), you will find the next golf course at the Costa Blanca. Being one of the smaller 9 hole golfcourses, it might be just the right kind of variety you are looking for, when you think you have played “them all”. The two additional putting greens and the twenty bay driving range offer enough room to practice your golf swing. For those of you who spend their holidays or live in Calpe, Moraira, Teulada or Benissa, the golf club Lfach would be a good place to start golfing at the Costa Blanca. As a 9 hole golf course, it offers a spectacular view over the coastline to the Penon de lfach in Calpe ( a huge impressive rock at the bay). With one putting green, it is one of the smaller courses around. Make sure you give it a try when you are around the area. You find the golf club at the round from Moraira to Calpe after about three km at the Urbanization of San Jaime. 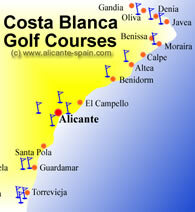 Heading southwards on one of our little maps of Costa Blanca golf courses, we reach the golf club of Altea. A 9 hole course just like the one in Calpe, with a five bay driving range. You find it in the part of Altea LaVieja (“Altea the old”), just after leaving exit 64 of the autopista AP7. Simply follow directions to Altea la Vieja and you cant miss it. Designed by Nicklaus Design, the Real de Faula Benidorm golf course is one of the best known around the Costa Blanca. Lying a bit uphill from Benidorm it allows an impressive view over the beach and city itself. Real de Faula has two very different 18 hole courses. The 300 meters driving range can host up to 60 players. Various practice areas like putting green, approach green, bunker. Should contact and book in advance, especially during high season. From Top to Bottom, Golf in Alicante , Guardamar, Torrevieja and Murcia. A bit north of Alicante, on the road between Busot and Bonalba, lies the area of bonalbagolf with its 18 hole golf course is located in among a lovely landscape. Over 3000 houses, villas and beautiful resorts are created around this Alicante golf ground. The perfect location for a relaxing holiday with all its amenities such as a Spa and a gym. The golf course itself is 6367 meters long and allows a breathtaking view over the Mediterranean Sea. Using the autopista (motorway) AP-7 you exit at No.68 and take the first roundabout directly to the PLAYA of San Juan. Do not get confused and go to San Juan, because San Juan is just the little village about 3 km inside the coast. You need to head for beach of San Juan or “Playa de San Juan”. Crossing the next 2 roundabouts you are right there. Hope this helps. The Alenda golf club lies a bit outside of Alicante. Drive the A-31 motorway from Alicante to Madrid and take the Elche / Aspe exit at about fifteen kilometers. 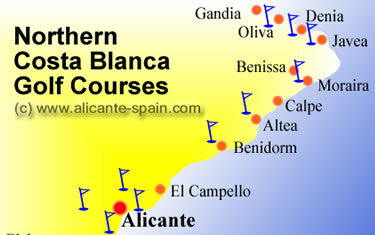 The course is located about 15 km west of Alicante. Open all year, it offers a 18 hole very demanding course, two putting greens and a 20 bay driving range. It’s one of those little known golf courses worth having played while you are around the Costa Blanca. This 18 holes course south of Alicante is ideal to hit a few golf balls at the evening or to practice you swing. With recent course alterations and green redesigns, it has become one of the most interesting golf courses near Alicante. The golf club el Plantio is located a bit south of Alicante. Leaving exit 71 of the motorway AP7, heading to Alicante west and the old street of Alicante to Elche. There after at 3 km you will find this small but very nice golf course. All those of you who spend their holiday south of Alicante, in cities around Santa Pola, Guardamar de la Segura or Gran Alacant, you might want to check out the following two courses for a nice round of relaxing golf around the Costablanca. Want to go golfing near Torrevieja? Well, you got plenty of golf grounds to choose from. Other than the two previously mentioned north of Torrevieja, there are three more golf courses just south of Torrevieja. All three courses are 18 hole grounds located at the coast of Orihuela. (Don’t get confused they are NOT located around the city of Orihuela itself), they are very close to Torrevieja, near the Costa.